Once upon a time, you were forced to awkwardly mark and copy text from one location and paste the text to the (hopefully correct) other location. Pictures to be uploaded had to be located and selected with the internet-browser’s file-dialog. An unwieldy, time-consuming and frequently irritating waste of time. And if the text was in another language, it had to be marked up, copied, and passed through translation-software, before being inserted in its final destination. Now, this can all happen much faster and easier. The advantages of click.to are obvious. Text, images, videos, and other documents which are selected can be sent to other applications with a single click. And the programs can even handle the selection automatically. You might say, click.to transforms everything in your computer into a hyperlink. An eBook. An incredibly intriguing business thriller. The author jumps wildly back and forth between different places of action. You’re completely losing track of the story because you fail to remember whether Hesjövallen lies eastward or westward of Närke and Figeholm. 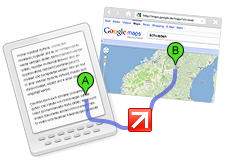 Now – at the summit of suspense – you have to minimize the book-reader just to open the browser and look up the places with Google Maps? Just to find out where the protagonist is? That would take all the drive out of the story. What to do? A click.to Google Maps is enough! Click.to will do all this for you in a single step. Mark and highlight the name in your eBook with the cursor as usual. Then press Control+C just as if you want to copy the name for pasting it to Google Maps. But now the symbol for click.to appears next to your mouse-cursor. Hover over the name with your cursor and a drop-down menu appears. Select Google Maps and the browser opens to display the result of your selection in Google Maps. Now that you know where the protagonist is, you can simply continue reading after mere seconds of distraction. Upload pictures to Facebook or Flickr with one click – How to? The party is over. Lots of birthday-pictures were taken which you’re simply burning to upload to Facebook or Flickr. What you get is a browser-menu that is cumbersome and time-consuming. Especially if you haven’t memorized the directory where they are stored, or if you don’t have your credentials available. Click.to approaches this from the other side: mark and select the pictures in the Windows-Explorer then click.to Facebook, click.to Flickr or click.to any other image-processing or picture-hosting service of your choice. Want to know what ‘Lycra’ is because you found the perfect pullover on the internet? Reading an article about theoretical quantum physics and need to know what ‘decoherence’ is? – Or you simply want to post a quote to Twitter as-is? Click.to makes that a snap. Highlight the desired object, the incomprehensible word or the quote, and click.to Google, Wikipedia or other websites. How often have you re-sent e-mails because you forgot the attachment? How often did the Explorer-Menu waste your time and test your patience while you where digging for the attachment? Start the e-mail with your attachment! Select your attachment on the desktop or wherever it is stored, click.to Outlook and your e-mail begins with the attachment. In combination with an Outlook-Indexer, such as Lookeen, the turn-around time in your mailbox is significantly reduced. Are you afraid of sudden data loss? Use the Outlook backup solution Lookeen Backup Manager to secure your data. You’re surfing the Net and read something you want to know more about? Mark a headline and click.to Twitter, Digg, Mixx or any other news-service to get information. Fast. Stick to the discussion and stay up-to-date. Did you open a text document in Microsoft Word, a picture or other content you want to archive? Click.to PDF is enough. 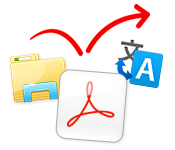 The PDF-document is automatically created and opened. All you have to do now is save it. No more hassle with inconvenient or expensive converter-programs. Take notes and you will save the annoying searching for specific content. Found a table on the Internet or somewhere else and want to work with the data? How about a click.to Excel? Click.to automatically detects the table-structure and inserts each value into its own cell. Full use and access to the data with just one click.to. Have a scientific text in German and simply need to decide if this has anything to do with your problem? A business letter lands on your desk from a country you didn’t even know existed? Who can tell you if this letter is important or not? Before you translate the item yourself, or have it professionally translated, simply click.to Google Translate for a simple analysis that should be sufficient and done in a few seconds – thanks to click.to. Click.to will prove a valuable time-saving tool. Click.to also has functions to search for articles, music, washing machines, and any other object for sale. Highlight the product, music, or object click.to Ebay, Amazon, or any other online shop of your choice, and welcome to the paradise of shopping. Click.to moves all the programs on your computer closer together. The trail, if you will, for the data is shorter because the user is taken through some of the more complicated work. Dealing with text, pictures, single words, films and documents easier, faster and more effectively. Separate applications are easy to implement yourself. You don’t even need any programming skills. Searches on particular web sites can be easily supplemented by, “Add a new action”. Just try it. Searches, as well as, the initial opening of web pages goes twice as fast with click.to. An open web page that you call-up often, can be added in seconds to your click.to plug-ins by, “Add Own Action”. Click.to can be combined with every possible program. You want to call in your favorite text editor or paste it into your self-programmed database – you can with click.to. On the upcoming Developer Page, there is a lot of information about working with our API and adding your own plug-ins. If you have any creative ideas just e-mail us.